Chris has been actively involved in outdoor pursuits for over 25 years initially as a freelance instructor and then in 2006, he set up Chris Hughes Multi Activity Services (CHMAS) to provide bespoke outdoor activity instruction and courses. Chris holds national governing body awards in canoeing, kayaking, mountain biking, single pitch rock climbing, summer & winter mountain walking and is an International Mountain Leader (IML). Confirmation of the mountaineering awards held can be found on the Mountain Training Association (MTA) website by clicking here. In addition to these technical qualifications, Chris is also an Accredited Practitioner of the Institute of Outdoor Learning (APIOL), Neuro Linguistic Programming (NLP) practitioner, A Rescue & Emergency Care (REC) first aid trainer and an approved assessor for the DofE. As well as working for CHMAS, Chris also makes himself available for freelance work which means he has opportunities to pick up new ideas and techniques. He is also a hill walking and climbing assessor for the Scout Association and regularly works at the Yr Hafod Activity Centre in North Wales. Janet has participated in most outdoor sports but her main passion is mountain walking both in the UK and abroad. She also acts as our office manager and will probably be your first point of contact when making bookings or answering any queries. Ray Goodwin is our Technical Advisor for the majority of our activities and is a well respected and experienced mountaineer (MIC) and paddle sport coach (BCU Level 5 in Canoe, Inland Kayak and Sea). As well as providing advisory services Ray also runs his own business Ray Goodwin Coaching, to find out more click here. 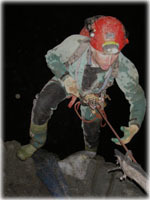 Alan Braybrooke is our Technical Advisor for our caving activities and is well respected and experienced cave leader (CIC). He also holds a host paddle sport qualifications, rock climbing and mountain biking qualifications and is an International Mountain Leader (IML).